The rising number of oil & gas drilling operations across the globe has been rightly touted as one of principal drivers of internal olefins market growth. While offshore oil & gas exploration and drilling activities have technically resulted in considerable ecological damage, it has synchronously prompted O&G manufacturers to bring forth a plethora of advanced drilling techniques, which would command the requirement of olefins. Additionally, the environmental damage has also forced regional governments to implement strict measures to curb the GHG emissions and protect the environment. Research has determined that internal olefins, being biodegradable and stable compounds, do not have much to contribute toward environmental degradation, making them viable candidates to be used in the energy & chemical sectors, as opposed to other compounds. Subsequently, this has led to an increase in product demand, thereby stimulating internal olefins market size, pegged at USD 1.5 billion in 2016. The huge presence of oil & gas resources in North America have led to extensive drilling activities being carried out in the region. In 2016 alone, more than 18,000 oil & gas wells were drilled across the continent, which has led to environmentalists ganging up against the activity, claiming that it would cause considerable harm to the ecology. On these grounds, the demand for environmentally safe synthetic fluids has come to the fore, which would emerge as a major driving force for internal olefins market. As a part of go-green initiatives, O&G firms have been abundantly using eco-friendly synthetic fluids to not only improve the operational efficiency, but to reduce the GHG emissions as well, further expanding the scope of internal olefins industry. The automotive sector in the countries such as China, India, and Brazil has been experiencing a commendable development in the recent years, favoring the expansion of the global synthetic lubricants sector, set to cross a valuation of USD 5 billion by 2024. Thus, the rising utilization of internal olefins as synthetic lubricants in the vehicle sector, subject to its beneficial properties such as low toxicity & friction and wear & tear protection, will lucratively influence internal olefins industry outlook in terms of volume and revenue. The availability of product substitutes such as alpha olefins, PAO, and LAO with intrinsic characteristics such as high purity may slightly hinder the growth of internal olefins market. The easy access to low-priced ethylene as an effective raw material in oil drilling can also impede the revenue graph of internal olefins industry. 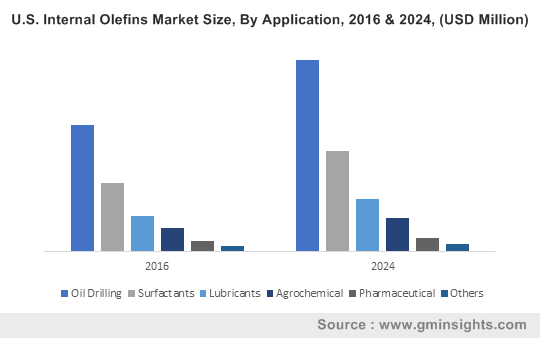 Nonetheless, business players have been attempting to overcome these challenges through the introduction of innovative products endowed with flexible characteristics, that may help augment the sales potential of internal olefins market. The product finds huge application across the pharmaceuticals, surfactants, and agrochemical sectors. Given that the modern-day consumer prefer high quality personal care and household products, it has been forecast that internal olefins industry size from surfactants may earn a revenue of over USD 350 million by 2024. Authorized bodies such as REACH & EPA have been undertaking stringent measures to reduce ozone depletion and deterioration of the atmosphere. This has, in consequence, led to the introduction of enhanced techniques for oil drilling, which would substantially impel internal olefins market share from the oil & gas sector. In fact, as per analysts, this segment is expected to account for more than USD 1 billion toward the overall share by 2024. Internal olefins market has successfully established its footprints in myriad geographies across the globe. While Europe and North America continue to remain prime contenders for accumulating a major share of internal olefins industry, Latin America has also, in recent times, evolved as a rather lucrative growth ground. The presence of huge players across the automobile sector in the countries such as Germany, in conjunction with initiatives such as European climate initiative (EUKI) in cooperation with the EU for mitigating GHG effects are expected to create a profitable roadmap for internal olefins industry in Europe. As per estimates, Europe internal olefins market will record a CAGR of more than 3.5% over the next seven years. U.S. internal olefins industry is predicted to generate an income of over USD 750 million by 2024. This forecast is primarily attributed to the rise in the crude oil exploration activities witnessed across the region. Speaking of LATAM, it has been observed that the region is being driven primarily by the country of Brazil. The ever-expanding populace of the nation has led to an increase in the food demand, which has lucratively influenced the growth map of Brazil internal olefins market. As per analysts, Brazil internal olefins industry size will grow at the rate of over 3.5% during the duration from 2017 to 2024, augmented by the large-scale product application in insecticides and fertilizers. The competitive hierarchy of internal olefins market comprises top shots such as Royal Dutch Shell, INEOS Oligomers, and Sasol Limited. These giants have customarily recognized their corporate social responsibilities, on the grounds of which they have been striving to manufacture green & sustainable products to maintain the ecological balance. In addition, they have been concentrating on raising their production capacities to fulfill the consumer demand. Driven by the exceptional efforts undertaken by corporate giants and the massive application range of this business sphere, it has been estimated that internal olefins market will accrue a revenue of over USD 2 billion by 2024.